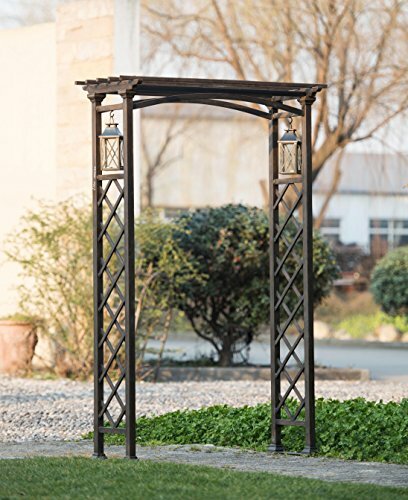 This elegant, classically styled metal arbor with lanterns will make a beautiful entrance to your garden or outdoor patio area. The side panels on the arch feature a beautiful design of horizontal bars & geometric decoration. Add beauty to this outdoor garden arch by growing climbing vines & flowering plants around it. In addition, you can also add lamps or light settings to further enhance the looks of your outdoor space. It also makes a great decorationpiece for special events, such as an outdoor wedding. If you have any questions about this product by sunjoy, contact us by completing and submitting the form below. If you are looking for a specif part number, please include it with your message.